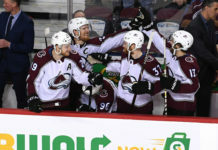 After losing the previous twelve meetings with the Nashville Predators, the Colorado Avalanche were finally able to take down the President’s Trophy winners by a 5-3 final score in Game Three of the opening playoff round. In each of the first two games of the series, Colorado got out of the first period with a one-goal lead but was unable to maintain those leads throughout the contests. Monday night at Pepsi Center the Avs ensured that wouldn’t be the case, scoring three goals before the first intermission. Gabriel Bourque then added his second goal of the playoffs to make it a 2-0 game after battling hard to dig the puck out from behind the net and redirecting a Patrik Nemeth shot from the point. The Avalanche didn’t back down and continued the high-tempo hockey they had played from the start. Nathan MacKinnon added the third goal of the period and his second of the playoffs with 1:53 remaining in the first. The goal was created from a superb pass from Gabe Landeskog that led MacKinnon into the offensive zone and all alone on a breakaway. MacKinnon beat Rinne glove-side. MacKinnon wasn’t finished scoring, however. At 4:25 into the second period, he picked up a loose puck in the middle of the slot and went post-and-in on Pekka Rinne, ending the Predators’ goaltender’s night when he was replaced by backup Juuse Saros. The Predators found some life after the goaltending switch, and halfway through the second period, they were finally able to get on the scoreboard when Ryan Johansen capitalized on a five-on-three power-play opportunity. The 4-1 lead heading into the third period wasn’t as comfortable for Colorado as one would expect. The chippy play stopped and Nashville began to push. 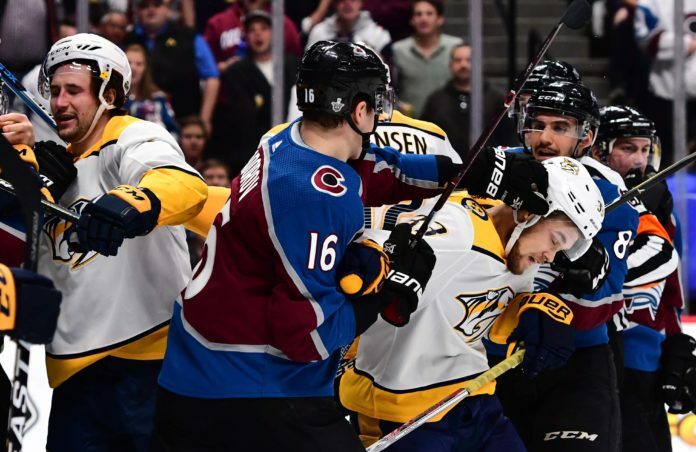 A Colton Sissons goal on a two-on-one about eight minutes in made it a 4-2 hockey game, and the Avalanche had to continue to ward off the Predators’ offense. “Even when they were scoring goals, we were saying the right things on the bench and staying focused,” Avalanche defenseman Mark Barberio said. 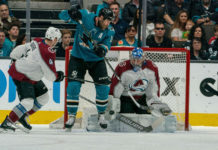 The ability to stay focused was vital for the Avs as they were able to keep Nashville from scoring during their final push, and Gabe Landeskog was able to add an empty-net goal with 2:36 to play. The Predators tallied one more goal just 21 seconds later, but by then it was ‘garbage time’ and the Avalanche sat comfortably with their 5-3 lead and their first victory of the 2018 playoffs. A pivotal Game Four will be played on Wednesday evening at Pepsi Center with the puck dropping at 8:00 PM Mountain.